Cards sent, gifts under the tree, lights up, and cookies baked...right? Now it's time to get the dies out and make little treat jars for the holidays. Arrange them on your prettiest cake plate or cupcake tower as a centerpiece - or add guests' names to create placecards and party favors. A set of them would also be a sweet surprise for a gift exchange. Co-workers or carpoolers would love them too! 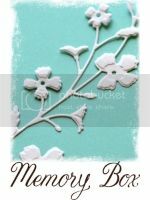 Here are just a few ideas - featuring Memory Box and Poppystamps Dies - with felt, cardstock and printed papers. I had such a great time designing these - hope you like them! Have fun with these jars - your guests will love them. Merry Christmas! I love combining simple shapes like the Perfect Gift Card Die 98177 with the elegant Fauntleroy Crest 98222 to add dimension to a card. This would be a fun card to mass-produce because each pear could be stamped and chalked onto different sections of the Yuletide 6x6" background, creating a unique look each time. For another idea - here's a link to Dave's great painted pears video - featuring the same Solid and Shaded Pear stamps and Twinkling H20's. See him stamping the Shaded Pear perfectly over the Solid Pear without a stamp positioner! We're updating and reconstructing our Memory Box Classes blog and will have our classes posted soon. Here's a link for the details on the classes that Lori Champine, Memory Box Design Editor Theresa Laurent and I have scheduled. Lori is at Ink About It in Massachusetts and Theresa and I teach at the Impress stores in Tukwila, Bellevue Square and University Village. Before we get started here at InKollage...be sure to visit Dave's blog and view his great Snowglobe video. Add your comments to his blog for a chance to win the expertly-engineered (that's Dave!) Snowglobe Dies with special clear, gridded windows for precise placement. Winners will be randomly-selected from comments added to Dave's blog by 12:00 midnight Pacific time on October 23, 2011. OK - back to today's project - meet Colin Bear (D1831) and his matching die (98233) from the new Polar Bear Studio release, on a rich red background from the Mistletoe 6x6 Set. His scarf is stamped on red felt, from Impress, adding toasty-warm texture to this holiday card. A quick Christmas Ticket (C1782) greeting diecut with Bistro Label (98120) and Diamond Jewel Stickers add the finishing touches. Hope you like the design - view the Polar Bear Studio release here to see the great new stamps and dies.